My daughter is ready to toilet train. I’m still mentally gearing up for the task ahead and assembling the necessary infrastructure – Bambino Mio training pants (essential), her choice of ‘big girls pants’ (hideous pastel numbers featuring ponies) and a good book. I have found that a toilet training story is an important part of the process – start reading it well before the nappy comes off and there is a good bit of subliminal advertising at work. 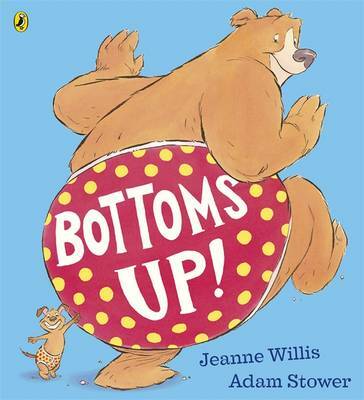 There are plenty of books about toilet training available, however the newly released Bottoms Up! by Jeanne Willis and Adam Stower was the perfect pick for my daughter. Bottoms Up! is less about toilets and more about undies. In fact, it’s about all kinds of undies and given that my daughter finds an opportunity for a wardrobe change at every opportunity, this book grabbed her interest. So we have elephants in smalls, kittens in knickers and bunnies in bloomers. The illustrations of the animals in underwear are terrific – the bats in bikinis make me smile but it’s the absurdity of a python in boxers and penguins in briefs that have my kids in stitches. Bottoms Up! is $22.99 and is available from Fishpond.